Horn soloist Chris Davies will debut on CD and streaming services this coming weekend, accompanied by the Tredegar Town Band. Horn soloist Chris Davies will debut on CD and streaming services this coming weekend, accompanied by the Tredegar Town Band under Ian Porthouse. Entitled Music for Tenor Horn: Recital, this new album explores the versatility of the instrument, both through its own repertoire and repertoire borrowed from elsewhere. Recital’s genesis lies in the soloist’s view that this is a situation that ought to be rectified. 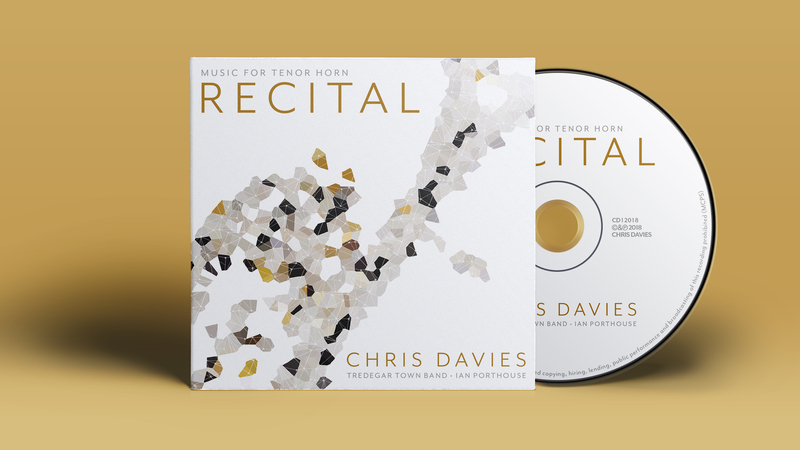 ‘There are so many people who love to hear the tenor horn played – and some who need to hear it played, like students and performers of the future – so I wanted to make at least some contribution to the body of recordings’ Chris added. The CD is replete with eclectic repertoire, with one eye on original horn repertoire and the other on arrangements that suit the instrument from other worlds. Perhaps the centrepiece is a rare recording of Gareth Wood’s Concerto for Tenor Horn, written for Owen Farr in the mid-2000s. John Golland’s Meiso is another rarity. Originally written for the Black Dyke Band’s tour of Japan in 1990, Davies takes on the role of Sandy Smith alongside Tredegar’s principal baritone Ben Stratford in a marriage of silken tone and lyricism. Recital showcases new arrangements too. Alongside stalwarts like Howard Snell’s take on Ravel’s Pavane and Michael Hopkinson’s fiendishly difficult arrangement of the finale from Mendelssohn’s Violin Concerto, are some of Davies’ own arrangements. The fourth movement of Mahler’s Second Symphony is treated with a tender touch by soloist and band alike, while the finale of Richard Strauss’ Horn Concerto No. 1 receives a cheery, yet impressive rendition. ‘This is a tremendous new album’, said Ian Porthouse, who conducted throughout the recordings. ‘Chris is a super player – a rare blend of incredible technique and beautiful sound that we don’t hear enough these days. It was a pleasure for us all to record Recital, especially with the guiding hand of Paul Hindmarsh crafting the performances throughout’. Music for Tenor Horn: Recital will be available on both Spotify and Amazon Music, with a limited print of physical copies available through the 4barsrest shop. Tredegar Band in concert in a programme inspired by the works of Thomas Tallis. The world's finest bands compete for the coveted title of British Open Champion. Tredegar return to the Royal Welsh College of Music and Drama in a joint concert with the Band of the Welsh Guards. Tredegar play at the popular Leeds Best of Brass concert series in Morley. 2019 sees Tredegar compete in Brass in Concert.